Online discussion forums are increasingly becoming common features in educational settings. Participants are required to post discussions about course content and are often instructed to comment on one another’s discussion posts. Despite this common feature, little research has been done that explores the relationship of comments and students’ motivation to learn. The purpose of this study was to examine how the quantity and perceived quality of the comments students received on their Youth Voices discussion posts relate to motivational outcomes (relatedness, perceived competence, interest—enjoyment, and value—usefulness). This study also attempts to identify the traits, or qualities, that the students value in the comments they receive. Results of this study have several potential implications for educators. Brophy (2008) argued that teachers need to foster students’ appreciation for what they are learning in school. Determining the traits of the comments that students value has implications for educators who have their students participate in online discussion forums. Such findings could provide guidance for participants to be valued members of their learning communities by instructing them to provide the types of comments that students find most valuable. 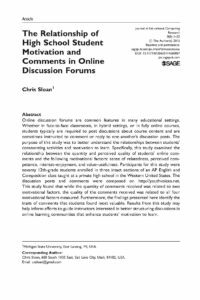 Similarly, exploring the relation of the quantity of comments and student motivation might help educators consider the amount of comments they should have their students contribute to online discussions.